I believe my role as a pediatrician is to work with families as a team to raise healthy and well-rounded children from birth to young adulthood. I feel this is best accomplished with listening and clear communication in a warm and caring environment. I strive to learn something new from every child and family I see, which continues to aid me in taking care of others." 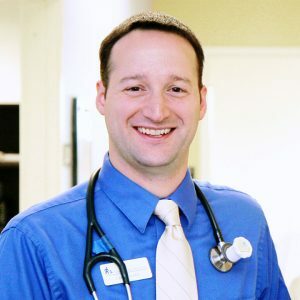 Dr. Elia lived in various places growing up, including Scotland and North Carolina, and after many years at UNC Chapel Hill (completing his undergraduate coursework, medical degree, and working in the Hematology lab), he was ready for a change and put down roots in Oregon. His internship and residency brought him to Oregon Health & Science University, where he fell in love with the city of Portland and future wife, Alison. Dr. Elia enjoys spending time with his family – his wife, two daughters, cat, and dog. He’s often found in the company of friends, traveling to North Carolina to see family, sampling Portland cuisine, tending his vegetable garden and fruit trees, reading science fiction, playing board games, or dabbling in carpentry. Outside of Metropolitan Pediatrics, Dr. Elia continues to feed his passion for taking care of others by moonlighting at Randall Children’s Hospital, seeing hospitalized patients from all over Oregon. "Dr Elia has been such an amazing doctor for my boys! Very genuine and caring. We never feel rushed. He always has great new insight for the developmental stage that we are going through. Great parenting and behavioral tips. We love him!" "Dr Elia and everyone at metro pediatrics are absolutely amazing!They’ve taken such wonderful care of our daughter from day 1. They always get us in promptly regardless of the problem, front office and billing staff are friendly and competent, nurses are caring and engaging and every doctor we’ve seen has gone above and beyond to help us with our concerns. Our daughter looks forward to her visits, and I appreciate them from the bottom of my heart! Great people all around!" "I've head great experience with Metropolitan Pediatrics! Staff is friendly and helpful. Dr Elia has been amazing and on top of things when my son really needed help. I am very grateful for this clinic and recommend it highly!" "Great service! We love Dr. Elia. He's great with our children."